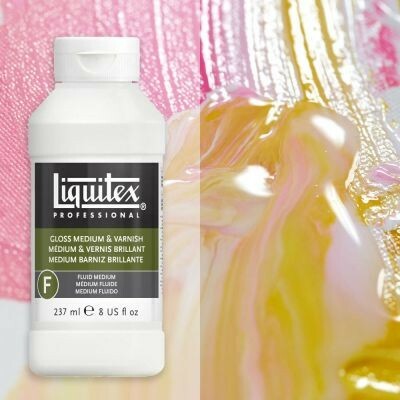 All purpose Liquitex medium, formulated to be mixed into all Liquitex acrylic paints and mediums. Dries to a non-tacky, hard, flexible surface that is resistant to dirt retention. Will not crack as surface expands and contracts during temperature and humidity changes. Applicable for any surface (flexible and inflexible) including canvas, paper, wood, Plexiglas, etc. The workhorse of the Liquitex mediums range. Gloss Medium & Varnish is an all-purpose medium that performs two functions. It can be used as a varnish and/or a fluid gloss medium. It improves adhesion of paint film and increases colour depth, intensity, and gloss. It can also be used as a non-removable varnish to protect the surface and establish an even gloss sheen.